Many managers botch the annual review process. There’s this persistent idea out there that the manager needs to provide “one good thing, one bad thing” on an annual performance review. However unlikely it is that the employee does an equal amount of damage as good over the course of the year, this model seems to persist. Many times, managers will actually go fishing for incidents that are bad. They’ll try to find those moments where the employee said something wrong, missed a step, or caused friction on the team. The manager will fastidiously wait for the annual review and then spring it upon the employee – Aha! You did this bad thing during the year! And I get to cite it on the review. Well no more of that! I propose the sympathetic model of performance feedback. In the sympathetic model, the manager looks at both the individual and the system in determining what the employee ought to have done differently (if anything) and what ought to be done differently in the future. When you look at an employee’s actions this way, you can see that there may be some greater forces that went into the employee’s behavior. 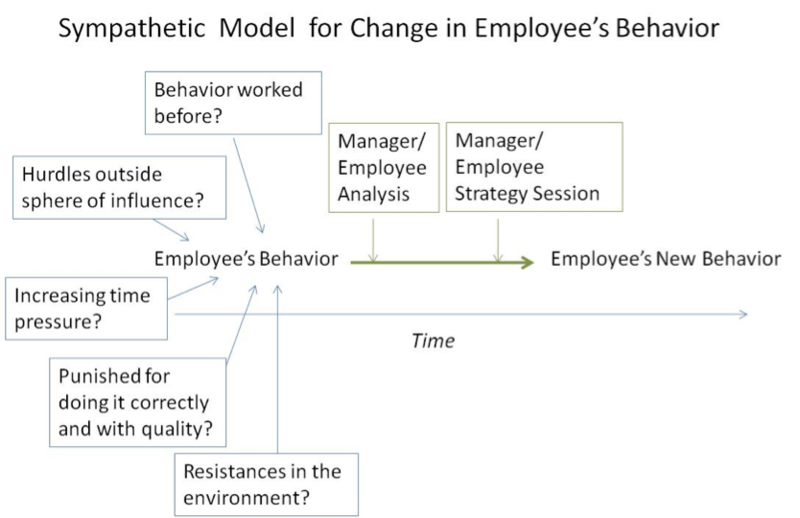 So instead of using a bad incident to cite what is wrong with the employee, the sympathetic model asks that managers engage in analysis and discussion with the employee to figure out what drove the behavior. Then the manager and the employee strategize on what to do next, and what should be done in the future. OK, now you have some good stuff for the employee performance review. If the employee actually does what you discussed as a result of the strategy session – that is, performed differently and better than before given the larger system — then this is good performance and should be rewarded as such. If the employee does NOT do what you discussed as a result of the strategy session — that is, did not change behavior or did something different than what you agreed the employee would do — then this is not as good performance and . . .
A second analysis needs to happen to determine if circumstances changed enough to go back to a new strategy session. And if the circumstances have not changed, then it was bad performance. The employee should have done what was agreed upon in the strategy session. Notice that in this sympathetic model, the employee can make mistakes, errors and fail, and still end up with high performance. Only if the employee persists on the non-agreed to behaviors does this mean poor performance. Imagine you and your employee looking at an incident or upcoming challenge, and coming up with a strategy – then you and the employee do exactly what you both strategized, and it still doesn’t work out. You both performed as best you could, and need to keep strategizing until you find what works. You’ve both failed, and you both are doing what it takes to turn around the failure. Yes, you’re both in it! There’s this weird expectation in many organizations that there is no failure involved in work environments. (Hence the pernicious appearances of “bad things” on a review – with the implication that “I saw failure in my employee – that’s bad! That’s a bad employee!”) When the situation is ambiguous, difficult, or complex, there is a lot of failure, but also a lot of high performance. You don’t always get the results, but the performance is there. This process of sympathetic strategy sessions with your employee is designed to increase the likelihood of great performance getting great results. It iterates and hones what good performance looks like, and creates more trust between you and your employee on what you’re trying to get accomplished. So back to the performance review. Now a “bad thing” on a performance review is actually a good thing. If an employee does something “wrong” in that there was some sort of failure involved, and then you strategize with the employee on what a better course of action is. . . and the employee actually does it. Then that should be cited on an annual performance review as great performance! Let’s compare how this may appear on an annual review. “Anne was involved in the [difficult situation], demonstrating a lack of [customer focus, ability to handle stressful situations, etc.]. This is an area of improvement for Anne. See – it’s not too hard to take a “bad” situation and cite it as good performance. In this example, even if Anne was somehow involved in a negative incident, this shows that Anne is flexible, open-minded, collaborative, and has the ability to change for the better. You may not always get the results you’re looking for, but at least you were able to collaboratively refine what you think the right behaviors are that drive to the results you’re looking for. And you want employees who then adopt those behaviors. This makes managing a collaborative experience, rather than a combative experience. If you have some reviews from the past lying around, take a look at them and try to find those times when a manager cites “negative performance” that could have been improved with a strategy session instead of a citation on a review of inferior performance. Then again, it may be too painful to do this. Does your manager take the sympathetic or unsympathetic approach to performance? Which do you prefer?